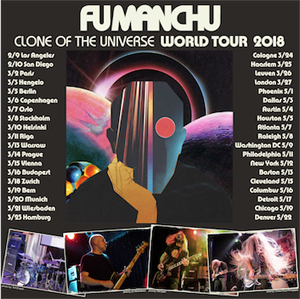 Southern Californian hard-rock legends FU MANCHU have announced plans to release their 12th studio album, Clone Of The Universe, on February 9th, 2018 via their own label At The Dojo Records. The upcoming record will be their first in 4 years, following the 2014 release of Gigantoid. Additional details and pre-orders will be announced soon. 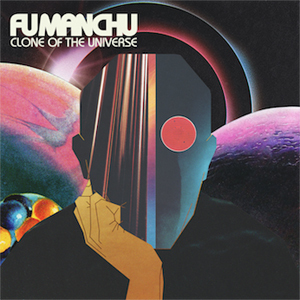 Follow the band at https://www.facebook.com/FuManchuBand for additional updates. In addition to the album news, FU MANCHU has also announced a world tour in support of the record. Dates are listed below. The band will be playing 2 album release shows in Southern California before hitting the road in Europe in March of 2018 and returning to the US in May of 2018. Additional 2018 shows will be announced in the coming months. The album was recorded and produced by FU MANCHU and Jim Monroe at The Racket Room in Santa Ana, CA with additional recording by Andrew Giacumakis at SUSSTUDIO in Simi Valley CA and will be released worldwide for streaming and on vinyl and CD on the band’s own AT THE DOJO RECORDS. FU MANCHU is Scott Hill (vocals, guitar), Bob Balch(Guitars), Brad Davis (Bass) and Scott Reeder (Drums and Percussion).